If you’re looking for an well-written and extremely easy to understand rundown of what makes shochu and awamori unique, then look no further than Chef Marc Matsumoto’s website, No Recipes. The upper bottle (right side) is shochu, the lower bottle is awamori. 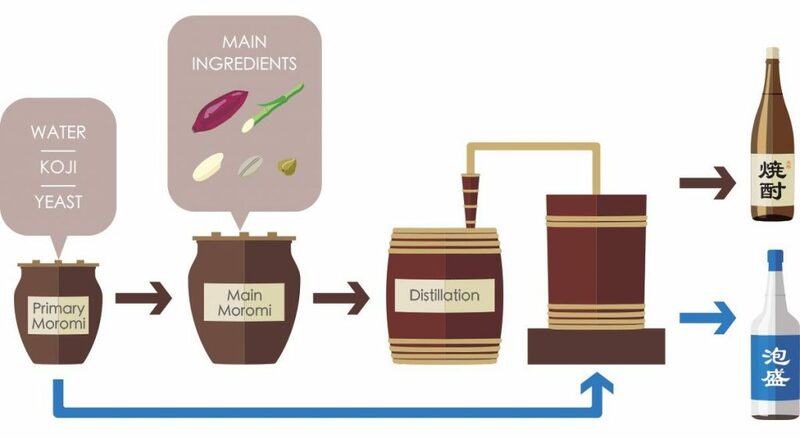 The word ‘moromi’ means fermenting mash. Marc splits his time between talking food trends and cooking on TV, creating content for his website, reinventing classic recipes, and leading cooking classes at various studios around the Tokyo metropolis. And he’s keenly interested in teaching folks about the many wonders of Japan’s indigenous spirits. Perhaps the best example of this is a recent article that he published on his website which efficiently describes the variety within this often misunderstood spirit category. Marc also spends some time on how to serve shochu and awamori, and how to pair them with food. Bookmark this article for future reference, and be sure to share it with anyone who will soon be visiting Japan or has a tendency to confuse Japanese shochu with Korean soju.